A sweet young Ugandan guy Mark, from our community, was leading about 20 of us along a narrow path, through some thick bush. We stopped for a while to watch two baby elephants playing. As we started walking again, I spotted a huge tiger crouching in the bush, ready to pounce on the baby elephants. Mark tried to chase it with a stick, but it didn’t flinch. We knew we had to pass it to get where we were going. Jordan was small (in my dream and actually 🙂 and was lagging behind, getting distracted by the scenery. Mark shouted, “Pull together so we look like a big elephant!” We all pulled in toward each other. Jordan got scared with all the panic and started pulling away instead of pulling towards us. I was shouting at him to come to us but he was crying and couldn’t move. As we huddled together, the tiger crawled into the bush and towards the back to where Jordan was. I noticed a tigress crouching on our right. They both had their eyes on Jordan. I kept shouting at him. They got closer to Jordan, but Asha managed to drag him in; just in time. The tigers backed off and disappeared into the bush. We kept together, shuffling slowly along the path, surprised at how much we did actually look like a big elephant. People just kept coming. Madhur Milan was soon too small for us and the owner wanted to increase the rent. We started to look for another place to meet. During our time in that red-carpeted banquet hall, we had many picnics, baptisms, meetings, parties and lots of food. We also had our first cross-cultural, “controversial” wedding. Ajit and Aphi were from Nepal and Meghalaya. Both families insisted that the wedding should not take place. Ajit and Aphi disagreed. Aphi came from a matrilineal society in which the youngest daughter of the family inherits all ancestral property. Husbands move into their wife’s home and the children take on their mother’s surname. If a couple can’t have a daughter, they adopt one in order to pass their rights to property to her. The birth of a girl is celebrated while the birth of a son is simply accepted. Aphi’s parents were concerned that she would lose her name to a man. They informed her that if she decided to do so, they would write her out of their will. Ajit was from a Brahmin Hindu family and his parents were not happy with his choice of wife or “religion.” Neither family agreed to attend the wedding. It was an exciting event for CNC. Many of our community witnessed a Christian wedding for the first time. Ajit’s dad graciously appeared to bless his son and actually really enjoyed the occasion. A few of Aphi’s relatives also attended and seemed happy with the proceedings. Aphi felt it right that she take on Ajit’s name. Having grown up in South Africa in the years of apartheid, I was kind of hoping I would never have to deal with it again. Unrealistic, I know. This beautiful wedding was our initiation into the pride and prejudice of parts of Indian society. Little did we know that there were many more to battles to come. Young couples would fight for their love and their lives. They would do everything they could to get the blessing of their parents. When they knew they would never get it, they would make a call to do what was right for them. That was a very hard call. Delhi’s infamous summer hit us from behind. We had experienced it on our short visits over the years, but we had never lived in it. The billies from the hills weren’t prepared for their first summer with temperatures above 45 degrees C.
Our Gypsy’s air-conditioning had given up the ghost during Tony’s accident (see Post 156) and the black garbage bag covering the right rear window didn’t even try to keep the heat out. Driving around Delhi was unpleasant to say the least. It wasn’t in our budget to get air-conditioners in the flat but we were able to install a desert-cooler in the living room. It was made up of a steel frame, a water trough and straw padding. When we first turned it on our house smelled like a horse’s stable, but it did the job. When the smell got too bad, we put a few drops of essential oil into the water and that was sucked up into the straw. Summer power cuts were common. With everyone using their air-conditioners, Delhi’s power source took strain. When the power went off, everything went off. No lights, no fans and no desert-cooler. Fortunately we had done a strategic swap with Raman and Kiron: our electric blanket for their inverter. This re-chargeable battery was able to run two ceiling fans and a tube light in the lounge for about three hours. During night power cuts, we would wake up drenched with sweat not knowing how long the fans had been off. One by one we would drag our mattresses into the lounge. The kids would soak their sheets in water and we would lie spread eagled under the two droning fans. There would be lots of giggling and silly nonsense before we finally drifted off to sleep again. When Dudley Daniel heard of our predicament, he very kindly helped us to purchase a/c s for the whole house. We were so grateful. Soon after that, someone unknown to us, sent us money to purchase a brand new Toyota Qualis. Again, we were amazed and incredibly grateful. For Jordan’s birthday we gave him a gift we could all use. We put it on our back balcony and it was perfect for those hot, sweaty summer nights. We had just had an amazing and much needed holiday in Goa. Over the years we had driven for four to five days to get to the beach, but this time we went by train which took about 36 hours. It was long but we survived. Jordan was good at making us laugh in tense situations so we had our share of free entertainment. When we arrived in Delhi we realised how different life was going to be. The road trip from Delhi to Mussoorie usually took about 9 hours. We would get off the train or plane in Delhi and sleep over in a cheap hotel or with our friends, Andries and Brenda. We would then get onto another train to Dehra Dun and then into a taxi all the way up the very windy mountain to Mussoorie. Sometimes we would arrive late at night and have to walk along the narrow path to our house with sleeping children and luggage. There was always someone to help us, but it was quite a feat to arrive home sane. This time we stayed with the Lindeques because we didn’t have furniture in our flat. Andries, Brenda and their children Sarah and Simon were already an important part of our new community. It was a Saturday. Arun Handa and Raman had secured a school classroom for us to use for our first meeting. All I could think of was, “What will we do with the DESKS?” We were grateful but all felt there was something better. At 5pm on Saturday evening, Tony, Raman, Andries and Arun booked the Madhur Milan Banquet Hall! It was across the street from Lady Shri Ram Girls’ College where Sharon John was studying. The guys came back very excited. Brenda asked if it had red carpets and it did. A few weeks earlier she had a dream about a place with red carpets. The next day was Sunday and we were wondering, like Asha had been, if anyone would come. We had nothing to worry about. Word got out and friends were brought. It was an amazing first meeting. There were about 40 people, including children. People stayed well after 1 pm to chat. It was an interesting mixture of people and we knew that once again we were going to be part of another Community of Nations. Enthusiasm and expectations ran high. Mid-week house meetings were set up and there we were… At the very beginning of a beautiful new community. No-one was more surprised than Asha. Our pilot friend, John Sinclair handed us upgraded tickets at the airport. He said we could sit with him in business class. He also had a first class ticket, which one of us could have. I was too scared to sit by myself so I declined. I couldn’t fly without holding Tony’s hand, so we all sat together. I burnt John’s ear off the entire trip with my silly questions. Every time there was a change in the sound of the engine, I asked him what was happening. I asked him about the pilots and why I should trust them to get such a huge, heavy piece of machinery into the sky and keep it there. What if one of them had a heart attack? What if both did? He answered patiently. I had seen too many plane crash movies. The most recent one was “Survival.” The plane crashed into snow-covered mountains. There were a handful of survivors who resorted to eating those who were less fortunate. The other movie was about a plane crashing into the ocean. The survivors spent the night in the deep with sharks circling underneath them. Most of them ended up as shark bait. I hated that idea. I didn’t want to eat Tony or be eaten by him and I definitely didn’t want to be eaten by a shark. Once, on our way to Australia, we did a transit stop in Malaysia. It was a rough ride. I got off the plane shaking and crying. I told Tony that I wasn’t going to get on the next plane. I wanted him to leave me there and pick me up on the way home. I wasn’t hysterical or loud about it. I was just totally prepared to stay all by myself for however long it took. He patiently explained to me that wasn’t going to happen. I would need to get on a plane to get home to our kids anyway. No matter how scared I was, I had to get back on the plane. As we were flying, I heard God gently but firmly say,” If you give in to this fear, you will affect your destiny and the destiny of your whole family.” I fought with fear and turbulence like they were the enemy. There was no way I wanted to give in to fear. I knew we were called to nations beyond India. The only way to get to those places was to fly. I needed to win the battle. I had to nail one issue at a time. I had to get right down to why I was so afraid. Only then would I be able to board a plane without being convinced that the plane I was on, was the one that was going to crash that year. It was illogical. It was base-less and limiting. It was to do with self-preservation. It was going to affect my destiny. i just couldn’t allow that to happen. 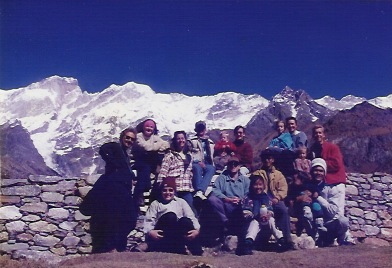 A few months before our move, the Watkinson family joined us for a hike to the Gangotri Glacier. 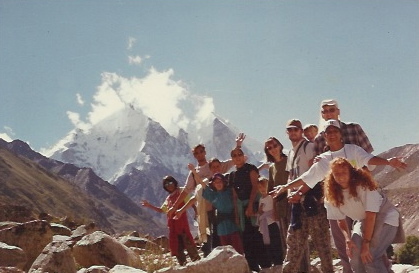 We had done the hike to up to Kedarnath with the Ferreiras and Jono and Char in 1996 and now we were going to the source of the great Ganga River. Left at 4.30 a.m. Gorgeous drive to Gangotri. 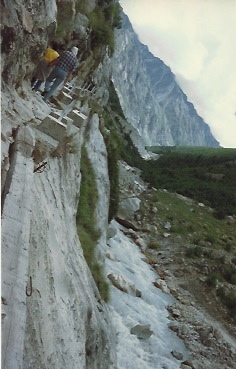 Huge landslides and incredibly steep gorges. Drove over a 410-foot bridge. Awesome and scary. Nice weather with soft rain most of the way. Arrived at 2 pm. The trainees were waiting for us. Had lunch and all slept for two hours. Woke up with such a bad headache. This place is full of the dark side. Little men sitting in caves and tents doing all kinds of cultic stuff. Incredibly powerful waterfall and amazing rock formations. Good sleep. Girls in one dorm, guys in another. Set off early for Bhojbasa. Vasanti pulled something in her leg and was in a lot of pain. She was determined to get there. Hiked for fourteen kilometres up to 12,385 feet. The guys took turns to carry Jordan in his carry seat. When the girls got tired they went on the mules; SO close to the edge at times. It was so good to get to Bhojwasa. Heard mice scuttling around all night. Found all kinds of things in our shoes in the morning. The mice had fun while we were sleeping. Left early for Gaumukh. It was a challenging nine kilometre hike but not difficult. We went up to 13,000 feet. Did a lot of boulder climbing. Vasanti said it was too humiliating to get on the mule, so hobbled almost the entire way. When she finally gave in, she was healed instantly! SO funny. Amazing to be at the source of the Ganga. The glacier is HUGE. Saw massive blocks of ice breaking off and floating down the river. We all stood on a big rock and prayed and prophesied over India for an hour. Good time. Really felt God’s presence. It was a long walk back to Bhojbasa. I walked most of the way with Esther. Talked about how spiritually easy it had all been. That night I had a really oppressive dream. It may have been a vision because I wasn’t able to get to sleep. I dreamt that I was thinking how easy it had been. Suddenly, Shiva’s face appeared. His mouth was huge and he was laughing right in my face. He said, “It was easy because I’m not afraid of you; twelve people praying on a rock. This has been my territory for decades. What do you think you can do?” The laughter was loud and intimidating. I was struggling to breathe but didn’t want to wake anyone up. I woke up feeling really discouraged and oppressed. I told Tony about the dream on the hike back to Gangotri. I felt my throat closing up and I started gasping for air. Everyone prayed for me and I was fine. I knew it wasn’t true. I knew our prayers had made an impact. I knew Jesus was more powerful and that He had been there not just for decades, but from the beginning of time. After a night in Gangotri we drove back to Mussoorie. It was going well until we hit very thick winter mist. It was so scary. We could barely see the road in front of us. Just before we got home, Tony and I saw two huge black holes in the mist. If we had been too distracted by them, we would have been over the cliff. When we got to our house, we were all shaken up but so happy. A cup of tea later and we were all in bed. As my granddad used to say, “A nice cuppa tea and I won’t need no rockin’ tonight. It was the monsoon and they were covered in cloud.